Getting more “girls at the grill” is of particular interest to grill manufacturers and specialty retailers, especially considering that industry statistics show that women are grilling out more and continuing to influence purchasing decisions in the household. Elizabeth Karmel at the grill. With her reputation growing, Karmel launched CarolinaCueToGo.com last year, an “online barbecue shack” specializing in North Carolina whole-hog barbecue, seasoned with Karmel’s signature Lexington-Style Vinegar Barbecue Sauce. This dedication to cooking innovation is an extension of her career-long dedication to indoor and outdoor cuisine. 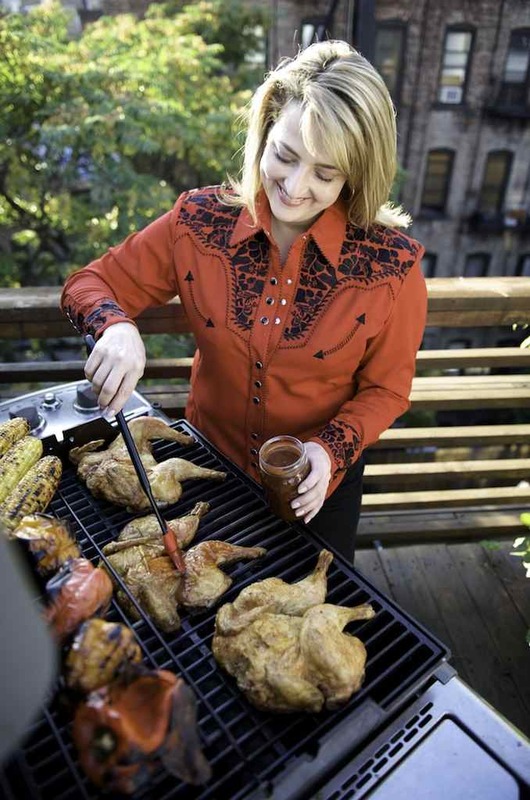 She is the founding executive chef of Hill Country Barbecue Market in NYC, Brooklyn, and Washington, DC, and NYC and Brooklyn’s Hill Country Chicken. She developed the award-winning menu and flavor profiles from the meats to the sides and desserts for both restaurant concepts.